Now my baby is nearing ten months old. Does she still enjoy being put in a carrier? Definitely. I'm not going to lie--I love it too. 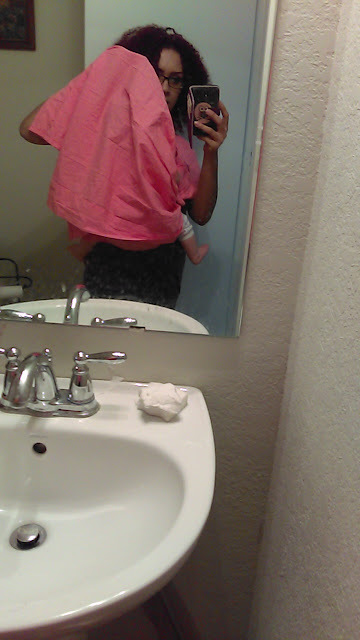 I now have a new ring sling to carry her in when I don't feel like using my others. 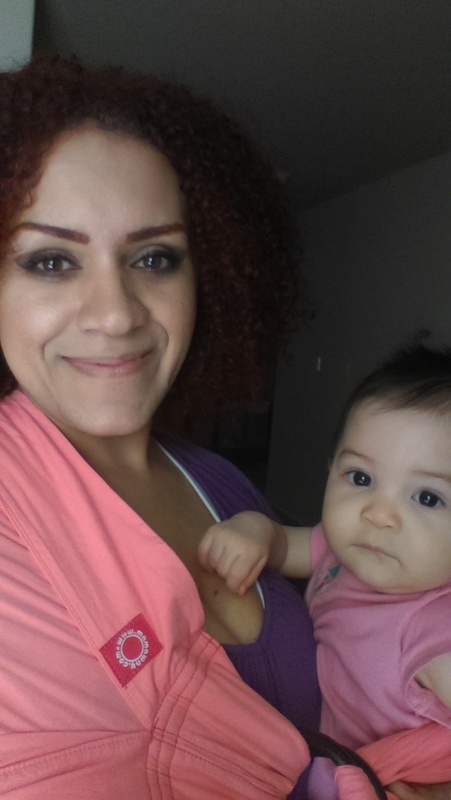 I've talked about the brand Mamaway before and this pretty pink ring sling was created by them. They come in quite a few different colors. I chose pink because, well, I wanted something girly and I don't own any pink carriers. The fabric is thick, but not sweater thick. It has a very long length so it can fit people and babies of many different sizes. Another thing that stands out about this product is the ring shown in the picture above. I like that it's not metal. 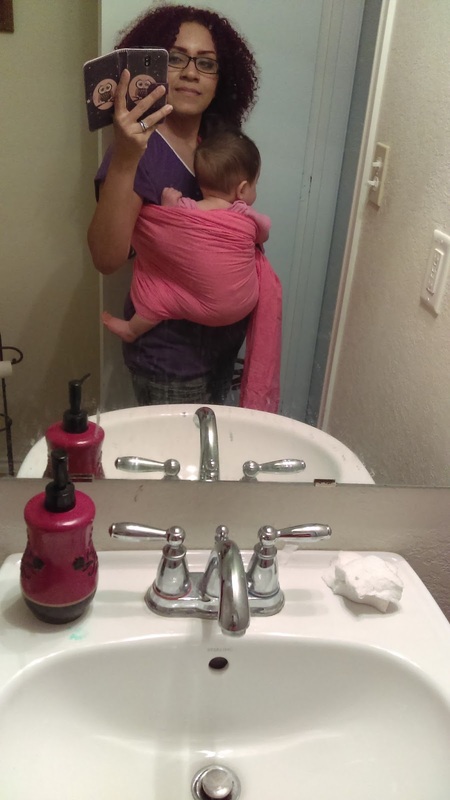 Now that she is older and heavier, a thick and sturdy ring made from something other than metal makes carrying her in a ring sling less difficult. The one that I own with a metal ring doesn't seem to keep the fabric from sliding and the ring is too skinny. This one causes better friction between the fabric and rings, so the fabric stays firmly in place when worn. 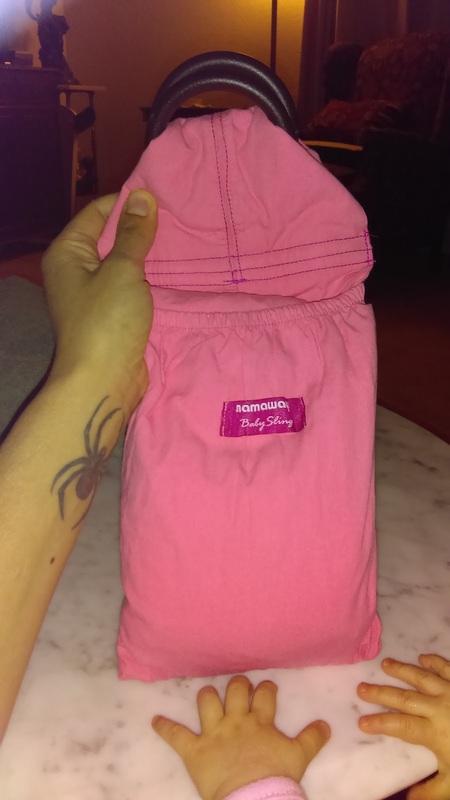 There is a pocket, also shown in the picture above, and when you fold the sling up in a certain way, it can be tucked away inside. I am able to carry my baby either in front of my body or do a side straddling carry, which personally in this kind of carrier, is most comfortable. She seems to prefer the side carry as well, as her legs rest better this way. She can look around a lot better than when she is facing me too. The nice thing about having excess fabric is the fact that if I need to nurse her or shield her from the cold air, I can cover her with the end of the sling. If it's truly a bother, I can always tuck the excess into the side or back of me. It's nice, isn't it. She has napped in it. played and giggled away in it, since she absolutely enjoys walking around with me and since she's high up against my chest, she is able to "converse" with the adults. It's a nice change from trying to get people's attention when on the floor. The benefits of a product like this are a great reason to own one. This product, available in a number of different colors, is available for purchase on Amazon. Disclaimer: I received this product in exchange for my honest review. All opinions are my own.